Did you know about the largely invisible and anonymous women of the fleet? 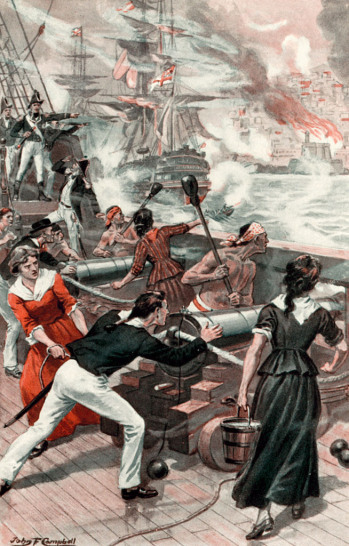 These were women who carried the powder, served at the guns, tended the sick and wounded, and undertook innumerable tasks about the ship. All ships had them, the wives of warrant officers, marines and seamen, they were an integral part of every ship’s company but their names were never recorded on the muster books or their presence officially sanctioned by the Admiralty. Most captains tolerated the presence of women aboard their ships, and one or two more enlightened commanders, Pellew among them, acknowledged the often important role they played in battle. After the Bombardment of Algiers, Pellew publicly thanked the British women (who) served at the same guns as their husbands, and during a contest of many hours, never shrank from danger, but animated all around them. The splendid illustration comes from Look and Learn of the women of Exmouth’s fleet doing just that!